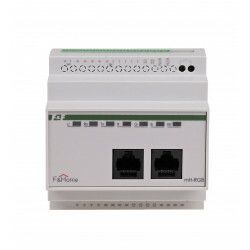 F&Home - wired intelligent bulding system There are 27 products. 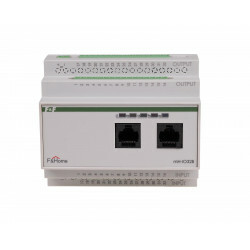 The mH-IO32 input/output module is the basic F&Home system module equipped with 32 binary inputs and 32 binary outputs (operating on the on/off basis). 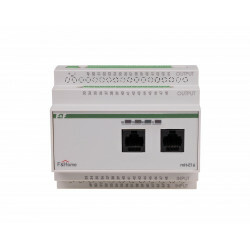 The mH-IO12E6 mixed module is designed to control both lighting (or other receivers operating on an on/off basis) and motor receivers (it is suitable for controlling external roller shutters as well as vertical and horizontal blinds). Motor module mH-E16 is dedicated to controlling all motor receivers. It is suitable both for controlling external roller shutters (anti-burglary) powered by 230 V or 24 V motors, as well as vertical and horizontal blinds. 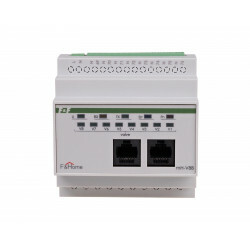 The mH-L4B module is a four-channel lighting dimmer designed to control the intensity of incandescent, halogen, energy-saving or LED lighting. RGB module is designed to control low-voltage (12 V) LED light sources by setting the brightness and color of the lighting. Multicolored RGB sources (such as stripes, RGB hoses) should be connected to the module, then the brightness and color of light can be adjusted. 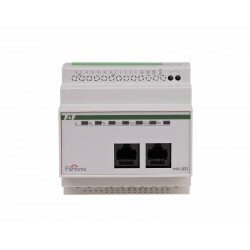 The mH-LED module is a three-channel dimmer of low-voltage lighting (12 V). The module should be connected to the LED light sources, for example, LED stripes, single-colored hoses. The mH-A10 module is a four-channel controller designed for setting values of 0 - 10 V for devices capable of controlling voltages from 0 to 10 V. In most cases, these will be devices such as lighting (brightness control) or ventilation (fan speed control). 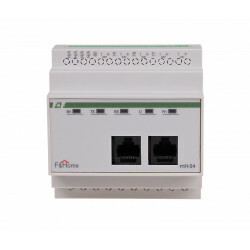 The mH-S4 module is a four-channel input for temperature sensors located in a building. The sensors are digitally controlled elements, which ensures high resistance to interference and allows to connect long cable sections without fear of temperature distortion. 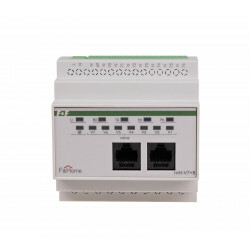 The mH-S8 module is an eight-channel input for temperature sensors located in a building. 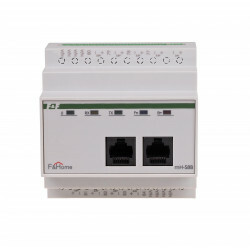 The sensors are digitally controlled elements, which ensures high resistance to interference and allows to connect long cable sections without fear of temperature distortion. The mH-V4 module is a four-channel actuator module controlling solenoid valves supplied with 230 V in building heating circuits. The module cooperates through the CAN line with the sensor module from the same level. The mH-V8 module is an eight-channel actuator module controlling solenoid valves supplied with 230 V in building heating circuits. 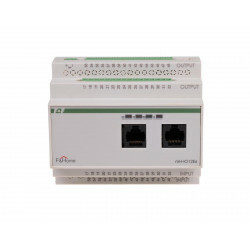 The module cooperates through the CAN line with the sensor module from the same level. The mH-V7+ module is a seven-channel actuator module controlling solenoid valves supplied with 230 V voltage. The module cooperates with the mH-S8 sensor module operating at the same level.